Susan is a petty thief in London, living what she thinks is an ideal life. Until Gentleman comes to her and her adopted family with a proposition- to entice a naive country lady into marriage with Gentleman, throw her into a mental institution, and abscond with her fortune. Maud is that country lady, but she is not naive. She is tired of her life in the country, locked up in her uncle's home with no power or authority. In Gentleman, she sees a way to escape. But things, for both ladies, don't turn out quite as they expect, and this novel is full of twists and turns that will make your head whirl. A short plot summary, but it's hard to summarize when there are so many potential spoilers! I was expecting a lesbian relationship because that is one of the common themes in Waters' books. I was surprised that it wasn't more of a major theme than it was, though. I thought it was tastefully done, though, and if it played more of a theme than I probably wouldn't have liked the book as well. I am not big on romance novels. I am looking forward to read more from Waters next year, actually. The two books by her that I don't own are all ready on my 'buy with Christmas money' list. I think I am reading one of them with Ana from things mean a lot, but I can't remember what at the moment! Anyways, I agree on it being natural and built on trust. As to my favourite character, I am like you. I can't really say who I enjoyed. I thought that Maud and Susan both had redeeming characteristics, so I actually liked both of them. Maud and her reading appealed to me at first. Then, though, there was everything that happened afterwards that made me not so fond of the reading anymore. I don't really want to say a lot because it is a potential big spoiler. Really, I could gush on and on about the characters and their stories and everything that came to pass, but if others want to read this book without knowing everything that happens I guess I cannot say nearly anything that I would love to say! Yes, I know exactly what you mean! It's hard with a book that has so many twists and turns to review it without spoilers. I agree with you on the romance aspect- I expected it to be a more prominent plot piece, but I think the book succeeded really well with it being pushed pretty far away from mainstage because we got to see the characters on their own, and get to know them individually, rather than as two halves of a whole couple. I thought that Waters did well with the settings, too. The old, decrepit country house that was so dark and gloomy, where Maud spent so much time trying to keep her mother's grave clean. The way the Thames by the house was so thin and weak, whereas in London it was so wide and busy. Seeing London as a frightening and dirty place that was kind of the end of the road for a lot of people. And the idea now that someone living only about 40 miles from such a huge city but never having been there is so hard to fathom, but just again goes to show the level of isolation women felt. And then the scenes in the institution were written so well, too, and just make a reader ache to read. Just great writing style all around! Do you agree? Oh, yes, I felt like I was there! I think she is fantastic all around writer. Not only did I feel like I really got to know the characters, but I felt like I was there. Even now that it has been a couple days since I finished the book I can close my eyes and picture the story through her description. I have never seen anything that she mentioned myself, but I feel like I almost have now. She is the sort of author that does not waste a word, but at the same time she is not long-winded either. She has just the right balance. Plus, she throws in the twists and turns, so just when you are starting to feel 'safe' you have another moment to consider what just happened! Talking about the book gets me very excited. I have read a lot of really good books this year, but I was feeling like I was lacking in the 'wow' books. The type of books that you are very sad to see end and that you want to reread again because you miss it all ready. That was this book for me! Reading this book was an experience and I cannot wait to have another one! I am not going to let it be two years this time! That's great! I love "wow" factor books, too. I will have to think back over everything I read for my year-end wrap-up post. I think Waters will be on the list of "newly discovered but long-on-my-shelf" authors. A great book- I can't really add to your description above, so I'll just say "hear, hear!" Thanks for reviewing it with me- it's definitely the sort of book that is fun to discuss with someone else, so I'm glad we did this! 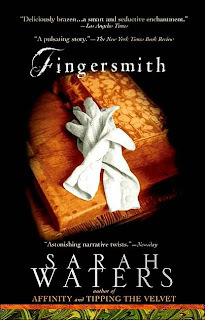 The Fingersmith is one of my favourite books, so I'm pleased to hear that you enjoyed it. I was surprised to see that Kailana thought the lesbian relationship wasn't a major theme, as I thought it was handled very well and was a prominant theme in the book. I loved the setting too - one of the most atmospheric books I've ever read. I had trouble writing a spoiler-free review as well, and ended up just focusing on the characters. I really liked the book though! Awesome review! I loved, loved, loved this book and still remember all the great things about it even three years later. I thought the twist was just excellent and I remember just popping right out of my seat with a huge "No Way!" when I got to it. I am so glad that you got around to reading this and that you loved it. It really is a great book! I really liked the book, too, and was trying to think of why I liked Affinity more. I think it's because I thought the foreshadowing in part one was a bit too heavy-handed. I was RACING to figure out what would happen, and I think that impeded my enjoyment of at least the first part of the book, if not the rest. I could have done with a little less of the "If only I had known then what I know now" stuff. This is my favorite of her books, followed by The Night Watch. The Little Stranger was a bit of a let down, probably because Fingersmith was just so awesome. I haven't read Tipping the Velvet or Affinity...yet. What a great idea, I really enjoyed reading your post. Thank you, Ladies! Y'all are EVIL. Here I am. trying to stretch out Waters' backlist as long as possible and everyone keeps raving about Fingersmith. I think I'll break down and read it next month! As I was telling Kelly, I'm thrilled you both enjoyed it! And I think you did an excellent job giving an idea of what the book is like without spoilers. This sounds fantastic and the cover just pops! Very interested in this book! Read this a few years ago and loved it. It was really unpredictable and there were quite a few surprising parts where I was just knocked of my seat. Great writer but this has been her best so far. I'm new to bloggger and have just discovered your blog. I've read Fingersmith twice, the second time for my bookclub two years ago - and it is incredibly well-plotted - deep, dark, twisting and treacherous, like the river that runs through it. I think it needs to be read twice to fully-appreciate all of the details. I read Affinity earlier this year, which is also good, very atmospheric, but I couldn't get into The Night Watch and gave up after a couple of chapters.